Agree that make accessories for the wedding photo shoot with your hands just great. Of course, you can use the accessories that you will offer your photographer. But he offers them to all couples, without exception. And you will make your exclusive and interesting. And then you'll be proud to tell their children, considering wedding pictures that the accessories to their wedding made themselves. To make wedding accessories with your own hands, you don't have to run to the departments of products for creativity. Bright letters of corrugated cardboard is easy to make from scrap materials. Cut from old boxes a few blanks of the letters, fold them in layers on top of each other for volume. Wrap with tape so not broken. Take satin ribbons of bright colors and tape the letters so as not to leave gaps. Ideas for letters: names, wedding date, the words "love", "family". These words can keep the bride and groom, with a large number of letters will help a friend and a girlfriend. Hearts - a traditional accessory for a wedding photo shoot. To make this wedding accessory with your own hands, buy a roll of red sisal fabric. Cut out some hearts in two sizes, about three pieces of each size. Glue for Wallpaper glue each layer and put on top of each other. 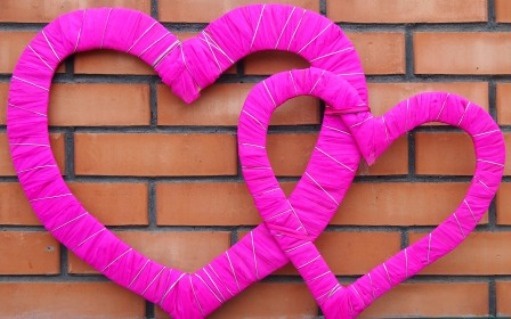 After the glue dries, it will take two or three days, wrap the hearts with the raffia. The same hearts can be made on the basis of decorative cardboard, decorate with rhinestones. add bows made of sisal, glue sticks. Based on these hearts make a garland, hang it or pick up. Wedding accessories with your own hands is easy to make from remnants of cardboard, a variety of decorative materials. Cut two hearts out of cardboard of different sizes. 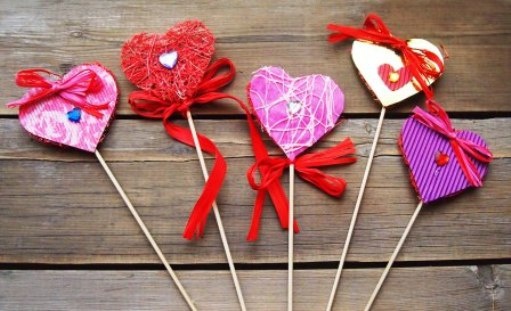 Cut the organza into strips and wrap hearts, connect them together. These hearts can be decorated the car, the interior of the hall or use as an accessory for a wedding photo session. Wedding - an event important in the life of every person. To prepare for this event in advance. To make wedding accessories with your own hands, invite the girlfriends, and a time of fun and useful thing to do.